RAILROAD.NET • View topic - Where exactly Nyack train station located? Where exactly Nyack train station located? Re: Where exactly Nyack train station located? the old train station was on Franklin street across from Elysian Avenue. The round house is now where the apartment house are on Franklin Street. The train was still running when I was a child. I was mistaken in first reply. The station was across from Elysian Avenue on Franklin Avenue, but the Round House was on the corner of Franklin and Depew Avenue. Kept nagging me that I had it wrong. but train has been gone for over 50 years. The Nyack train was not the same one that ran through Nanuet. It started in Nyack. DocJohn wrote: CarterB is correct. Tappan Zee bridge built sometime before 1958. Would really like to see pictures of passenger trains at Nyack late 50s. GeorgeF wrote: I was on the last regular train to Sparkhill. While I was wondering how I was going to get back, I heard some other railfans asking to ride back. The conductor agreed and charged regular fare, but with all three trainsets coupled together and running EXPRESS, it was a heckofa ride back to Hoboken! I realize this message is almost five years old but George if you still occasionally monitor this thread, I believe a few of my fellow members of the R&LHS New York Chapter were on that same last run and also took the deadhead back to Hoboken. Maybe you know them? Jim Guthrie and Henry Deutch. Anyway, I visited Nyack a number of times and the old ROW is still very discernible. The part just railroad east (or south by compass) of the station still exists (or did as of a few years ago). It's ruler straight and you can easily see where the old station was once located. Btw, looking at old local newspapers (on microfilm) at the Nyack Public Library I found a really wonderful story about the last run of an evening eastbound train. This was on Thursday February 15, 1940, the day before the service was reduced from twenty trains a day to six. Three down in the morning and three back at night. The last PM eastbound was Train No.1124, made up of a single gas-powered motor car. The reporter sat in the car at the platform in Nyack interviewing the train conductor before departure. They had to wait for the arrival of Train 1111 from Jersey City (the line was single-track) and also wait for a messenger to arrive with the last mail pouch from the nearby Nyack post office. The article noted that the following day the Nyack mail would start going by truck to the West Shore station at West Nyack. When 1111 arrived from Jersey City Oscar Blauvelt, the conductor on 1124, was on the platform. The reporter wrote that most of the commuters getting off 1111 paused to shake the veteran trainman's hand and wish him well. Many of them had been riding with Blauvelt since they were kids! With four engine and train crews being furloughed, Blauvelt had decided to retire after 44 years on the Erie, most of it running passenger trains between Jersey City and Nyack. Train 1124 departed Nyack a few minutes late on the last run -- because the mail was a bit tardy in arriving I think -- but it didn't matter much as the train had to meet two other westbound trains at Sparkill. That's an interesting photo. According to a roster I have, EL 1405 is the former DL&W 966. 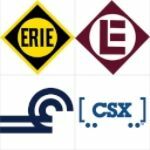 The Erie passenger GP-7s were numbered 1400-1404. 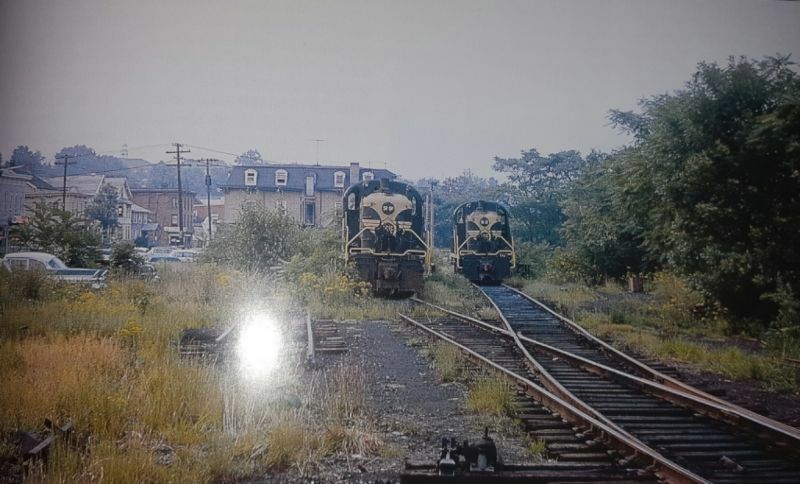 The image posted by Graham Junction is the first one I have seen of Nyack Station in rhe diesel era. That's granton junction! It is interesting that the 20 train schedule came to an end in February 1940. This was the first time that I was able to pinpoint the date, thanks to the poster. No doubt that buses across the GW Bridge cut into ridership over a 10 year period after the bridge opened. A section of stick rail is pulled up at the Englewood Station, and there are ties across the tracks there. No trains have gone north of Englewood for several years. I am surprised tho that CSX has not pulled up the trackage north of Englewood since it is finis for the Northern Branch north of Englewood. 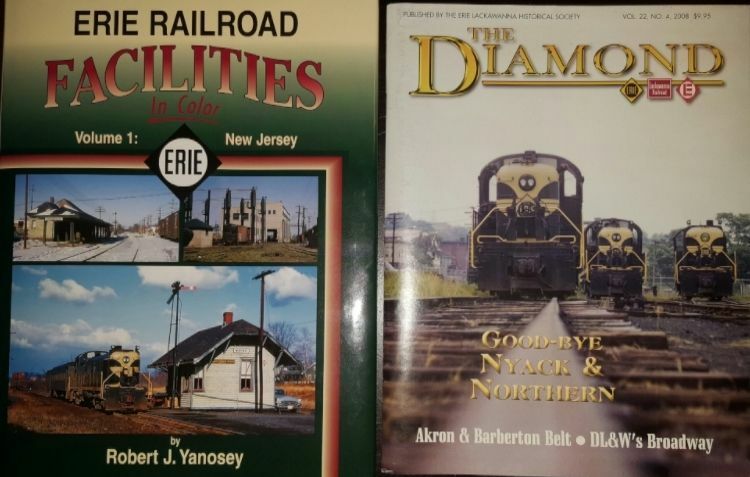 I recently purchased a few books covering the Northern Branch. 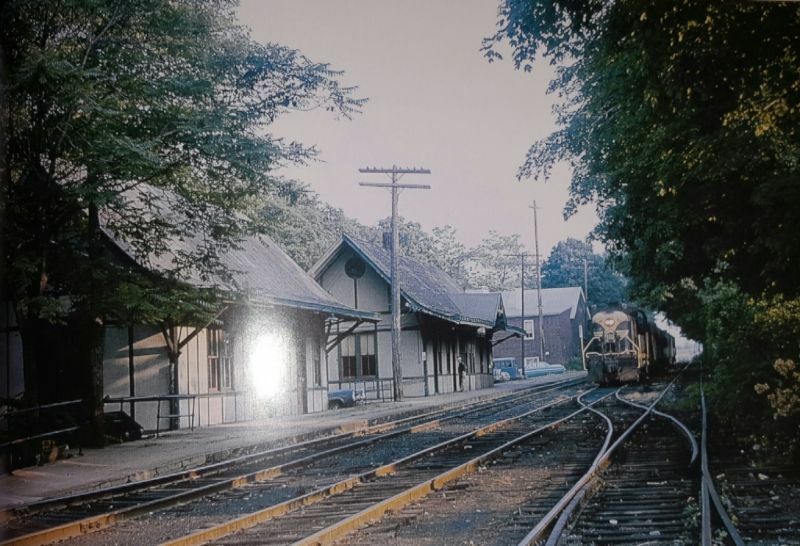 Here's a picture of the Nyack station with a diesel locomotive. Another shot in Nyack with a couple diesels just before the turntable. What book are these photos from? You will see the turntable, yard and station clearly in the 1953, 1964 and 1965 views, gone by 1974 view. I got a few books but these 2 were the most useful. The one on the left is still available at morning sun books and the other one is more of a magazine I found on ebay.